365/365 – “Meet Shadow” nr.31, a photo by Luca Rossini on Flickr. Thirtieth first and last of “Meet Shadow”. Here we are. Day three hundred and sixty five, the last day (and shot) of “Meet Shadow”, and the last day (and shot) of the “365 Days of RX1: one camera, one lens, twelve projects” (my second 365 in a row). Let me say it straight: tomorrow I won’t be starting a new 365, nor will I be doing anything like that in the near future (shouldn’t major events happen to push me otherwise). This second 365 has been exhausting, because of the twelve themes, because of the limitation imposed by the single focal length, because of my life suddenly turning into full-time photography, because of me becoming self-employed from being an employee, etc. It has been exhausting and I feel exhausted. So, what happens next? I’m pretty sure I’ll be back blogging about new projects and activities pretty soon, but right now I need to take a little time off the blog, see what my options and ideas are and evaluate how to procede. When I started the “365 Days of RX1: one camera, one lens, twelve projects” I left a life I knew well (which I studied and worked very hard for) to adventure myself into a new and vastly unknown life. Today it is not only the end of my second 365, but also (and mostly) the day in which I look at what I accomplished, built, learned, and understood in what has been (and surely will always be) one of the most important years of my life. And the thing is, the sad thing is, I don’t think I’m even a bit close to being sure about anything. After a whole year spent on photography, without other distractions than life itself (which can be quite a big distraction for a family-man), I’m probably more confused than I was when I left my job to be a photographer one year ago. Sure, my days now are dedicated to photography, but being self-employed and scraping out my living with weddings and family portraits made me way more busy with what’s not “my personal photography” than I may have ever been before, when I could stop working (and worrying) everyday around six and spend the rest of my day on my family and hobbies. Now I never stop working and most of what I do needs to be done to keep the (little) money to get in. Definitely not what I was hoping for one year ago. 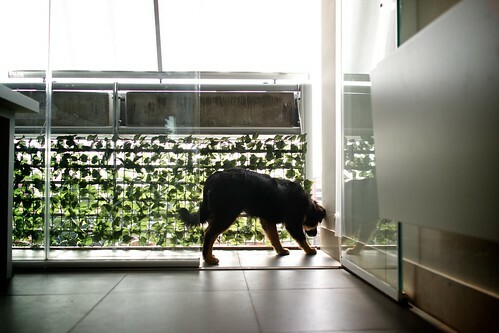 I kind of feel like my dog Ombra, during the long hours in which she has to stay home (with us, since we work in our studio-apartment), wishing to be out in the sun doing what she was born to do. I truly feel the very same, during those very same long hours. So, by tomorrow I’ll be working on my next year, that is, on how to steer my life into the right direction. It will be my personal 365 project, the first “private one since the last two years, the one without posts or photos to record it. Because without all the blogging work to do, I’ll surely have some extra (precious) time to invest on the never ending quest: what am I supposed to do with my life? So I guess this is it and here comes the last review. I admit that I expect something else for the last theme, but you have explained your situation perfectly. Only those who have a dog in their family can understand how important they are. They literally become family members and as it’s important to photograph our children when they are young, it is as important to capture the puppy time as well. And while this theme doesn’t have creative excitement of other themes, I find it has perhaps the best story telling aspect of all themes. Story continues from picture to another very nicely and the whole theme gets more depth. You have also shared some very personal things which connects this theme to other themes as well. All this encourages one to watch it to end. I bet this has been kind of difficult theme, because of subject (you can’t guide Ombra so much, at least yet!) and little time you available for doing this. I like the way you have shown how Ombra grows and what she might be thinking/feeling – this way we get to know Ombra. Interaction between Agata and Ombra plus how your social group relations changes with a dog is been interesting as well. Some of the best pictures, for me, are: 1, 5, 10, 21, 23 and 26. Why did I like this theme? Simple answer is its simplicity and positivity. It’s ordinary, even mundane, but in that nature it has been interesting to follow. ‘a Straight Story’, if you happen to like David Lynch, and yet it’s all true and something I can relate to. Having a puppy is wonderful and enjoyable. Now something about the whole year. It would be impossible to put all themes in order of greatness as they all have different strengths. However I want to raise up some of most memorable points from the year. Starting from day one the first nine pictures has got to be the best example of creative photography of all year. Taking different viewpoints to yourself with similar setup, but always surprising. I really admire this creativity. Then we went to celebrating a new pope in black and white, a set of documentary pictures where I especially remember the crowd pictures and gorgeous shots from inside Vatican. Very graphical with a classic look, definitively one of the best themes one might say. Then back to creative photography with surreal Doll’s house which was haunted by the ghost of Rossini. I found it intriguing that with such a small set up one can work up so many photographs. Loving it and it reminded of murder mysteries which take place in isolated places a la Agatha Christine. As if I hadn’t already been very impressed by your work, the X/Y Project showed some seriously meticulous work with astonishing care for details. For big contemporary art galleries this would be my choice of all the themes. If it isn’t already, take it there. It will impress anyone. But these are not the only characters you’ve created. I will always remember the dentist-batman and alien(ation) that lurk us all. One is good and other one bad, but they both share similar humor. Then one delight of the year has of course been watching Agata grow. Following her through your photos has cast warm feelings for many I’m sure. She really is a star of many of the most memoriable shots and most precious as well. Now that your blog is over I will surely miss her. Then the most unexpected theme of the year had to be Metamorfoodist and the color menu being best of them. Night Walking was like going back to Nex-7 times, but this time it was different and it looked different as well. I especially remember the headless children, graffiti tags and art halls, but also your grief. My condolences for the loss of Lucy once again. With Sacra Famiglia I also got to meet your family. Surprising and didn’t expect that either! And in the end, if this year had been a symphony, it ended with major chord; a playful puppy named Ombra, which made everyone happy. Needless to say this has been a great year to follow your blog! All in all, 365 days of RX-1 has showed us many faces of Luca Rossini. Being able to change hat and continually develop new creative setups is definitely your strongest skill when it comes to photography. I can often see a good photographers concentrating on single theme of pictures and maybe by being afraid of failures they avoid different subjects and approaches. Compared to them you obviously have a talent to make photographs interesting, by setting up surprises and telling stories. You truly are a great photographer and sometimes I wonder how one can get so good with it. Having said that it makes me sad to hear that photography with realities of making income of it has become a sort of prison for you, if I can put it in that way. Being an ex-entrepreneur myself I remember the feeling even too well, and different people find different solutions. I really hope you find your answers and come to see that these two years form a bridge to something meaningful in your life. Now that my last review is coming to an end, I want to bring up a more personal viewpoint as well. As you already know, this blog and your earlier Nex-7 blog have both been very important sources of inspiration for me. While inspiration is good, it’s not only about that. Because of you I started my own journey and who knows where it will take me. And while it has changed my photography in way I will remember probably rest of my life, it’s not about that either. It all started when you commented my pictures saying ‘you surely have an interesting eye’ (Day 343 of Nex-7 blog). It felt such a sincere comment that it gave me confidence regarding my own photography. When I later on presented my photo blog plan to you, you took it seriously, even if it was just a bones without meat really. So it happens that it’s the little things that become to matter the most. In the end, it’s your genuine benevolence and goodwill that I appreciate the most. Thank you for that and you are a good friend, Luca. I and many others will surely miss your blogs.